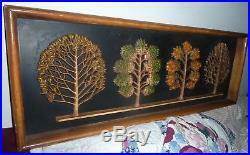 Vintage Syroco (no label) Mid Century Four Seasons Of Trees wall plaque (heavy) measures 11 1/2" x 31" nice wooden frame. The item "Vintage Syroco Mid Century Four Seasons Of Trees wall plaque MCM" is in sale since Wednesday, April 18, 2018. This item is in the category "Collectibles\Decorative Collectibles\Wall Hangings, Mirrors".com" and is located in Montrose, Pennsylvania. This item can be shipped to United States, Canada, United Kingdom, Denmark, Romania, Slovakia, Bulgaria, Czech republic, Finland, Hungary, Latvia, Lithuania, Malta, Estonia, Australia, Greece, Portugal, Cyprus, Slovenia, Japan, Sweden, South Korea, Indonesia, Taiwan, Thailand, Belgium, France, Hong Kong, Ireland, Netherlands, Poland, Spain, Italy, Germany, Austria, Israel, Mexico, New Zealand, Philippines, Singapore, Switzerland, Norway, Saudi arabia, Ukraine, United arab emirates, Qatar, Kuwait, Bahrain, Croatia, Malaysia, Chile, Colombia, Costa rica, Dominican republic, Panama, Trinidad and tobago, Guatemala, El salvador, Honduras, Jamaica.